Many reading this (well okay, the two or three people reading this) probably already know Motor Loon. He’s an SL designer/builder with a reputation for building wonderful custom motorcycles and cars. All his vehicles show a signature attention to detail, historical legacy, and style. 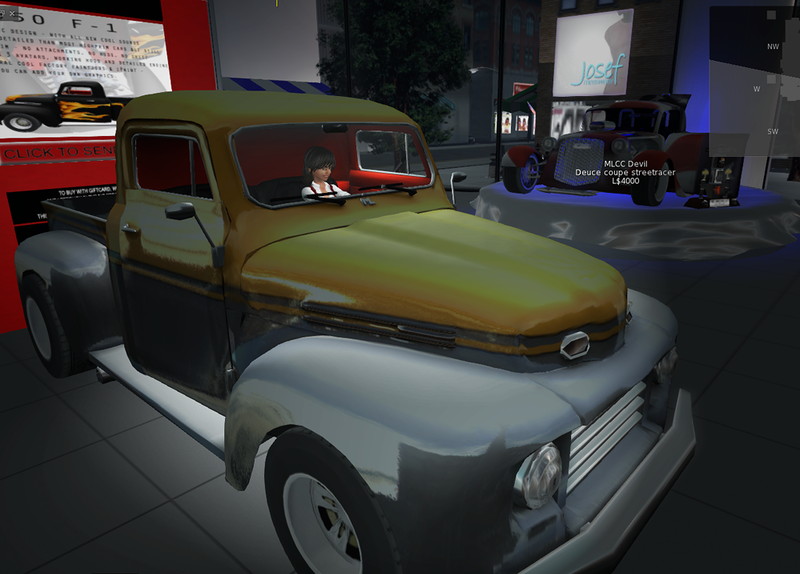 If you’re tired walking on SL roads and you miss that old carbon monoxide fix, you should stop by an MLCC show room and test drive one of Motor’s gas-guzzling works of art! This blog is supposed to be about sailing of course, and I mention these rubber-wheeled wonders only to emphasize that Motor Loon is a graybeard SL designer; he knows his way around a prim or two. That’s what I took a second look this week at a popular new boat that just hit the water and is generating a lot of smiles in the cruising crowd. it’s the Oceanic Mk 1, and it’s the first production sailboat designed and marketed by Motor Loon. 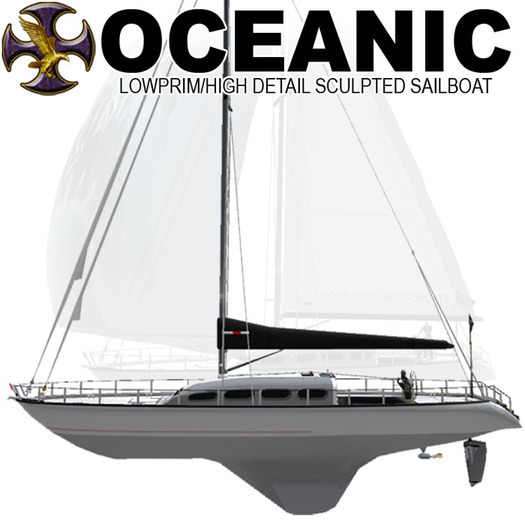 Oceanic is a sizable (74ft), cruiser that sports a modern design and a sloop rig powered by a BWind 2.x engine. Although there are few similarities, please don’t confuse this boat with the Oceanis schooners. Just to mention one major difference between the boats, the Loon Oceanic somehow fits into a 32 prim sailing package, while the Oceanis fully rezzed takes up over 500 prim! Despite it’s very small prim-footprint, the Oceanic is well adorned with nautical details that should make any salty SL skipper smile. Of course it has an expansive cockpit that can hold all your crew. Beyond that however, the skipper’s station is a delight, with a single large wheel that controls the helm and a central binnacle that supports multiple display screens. The skipper animation stands vigilant behind that helm, turning the wheel in synchrony with the user’s key clicks. But before we talk about Skipper controls, let’s get back to Oceanic’s layout and appearance. As I said, it’s only 32 prim, and the boat is no-mod; that will limit your ability to personalize the vessel. This boat comes with a large, fully-equipped cabin too. It has ample headroom, and the options should meet any cruiser’s expectations on a long, grid-wide passage. There are a few things rather novel and remarkable about the living space aboard this boat. First on the list is the fact the cabin is an integral part of the sailing vessel; it’s not an add-on, and it doesn’t rez only when you’re moored. 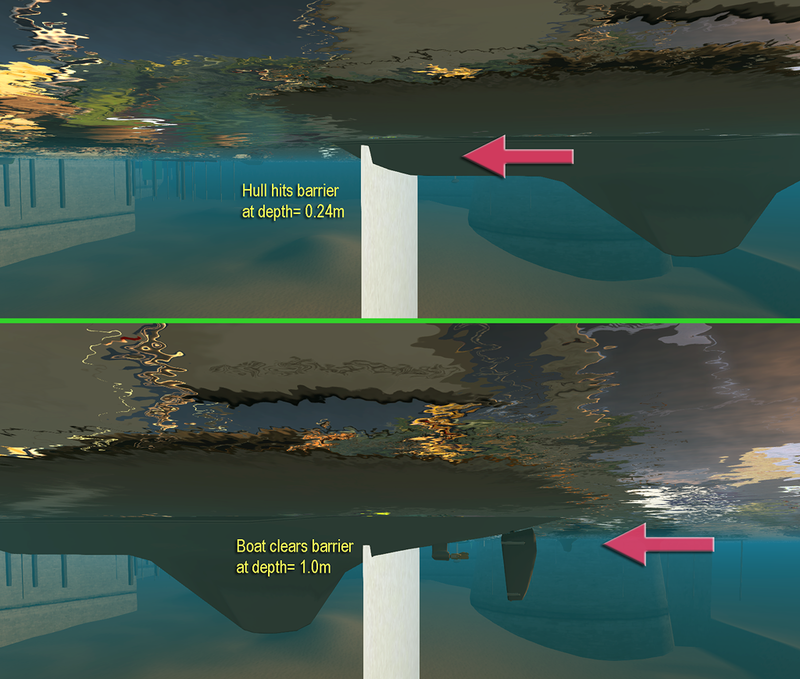 In fact, the picture above is tilted because the boat was under full sail while I was taking a break down below! One more issue on this topic: The Oceanic allows a skipper to actively jump to any of a large variety of different pose positions. for example, when I took the above picture, I was actually still managing the boat’s helm and sheeting the sails. The same is true for the picture on the right. Have you ever been in a long race in SL and needed to go to the bathroom? 🙂 If you’ve ever been in that precarious situation, you’ll appreciate this boat. 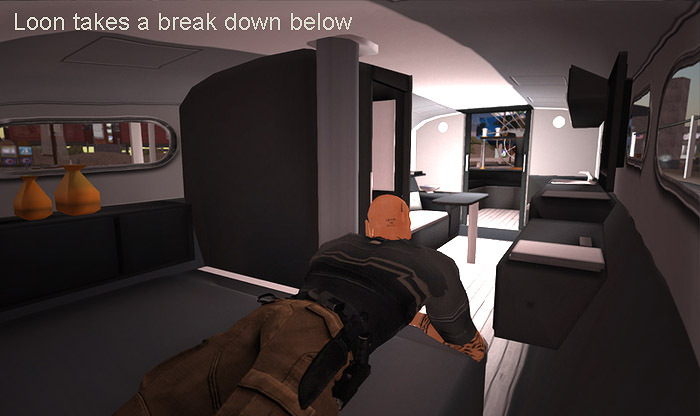 It includes a menu that lets you switch positions without losing control. It’s a simple idea, but a pretty great one! There’s often a mismatch in SL between the visible boat you can see and the underlying shape of the sculpted prims that make it up. This can result in inadvertent collisions, groundings, and accidental race line errors. I did a set of standard “bump tests” on the Oceanic to check this out, mostly by ramming it into various objects. 🙂 The Oceanic came out pretty well. The boat hits the dock as it should, colliding with the very tip of the bow. The sides of the hull also line up well with the ‘collision zone,’ evidence of some rather nifty workmanship. 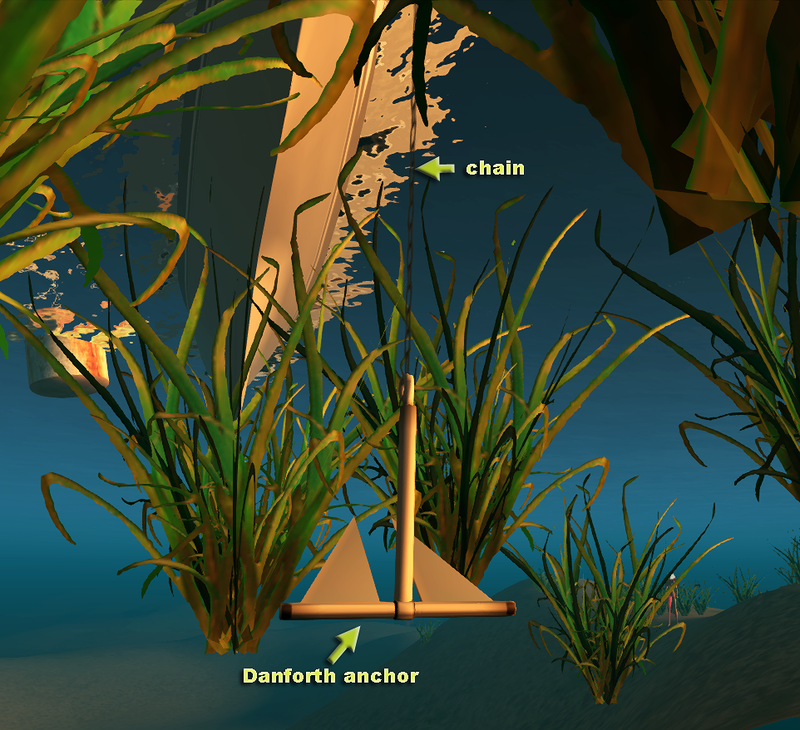 I tried to trick the boat by dropping anchor and then raising sail to get underway, seeing if it would drag the anchor. Well, Oceanic was too smart for that. It first paused for a moment to raise the anchor, then it cranked halyards to get the sails up! 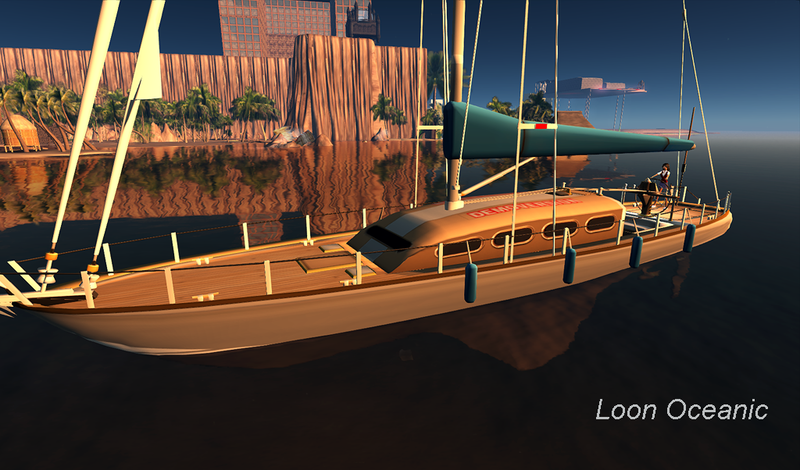 I think this boat is very nicely constructed, given the narrow limits for a sail vessel in SL. However, I think its also fair to comment that many fine details fall short of the nautical finesse seen on boats by other legendary yacht builders like Jacqueline Trudeau, Balduin Aabaye, and RJ Kikuchiyo (Did I mention Nate Herreshoff?) Go compare the stanchions, cleats, stays and section joints; you’ll see my point. The wind engine is ultimately the soul and brains of any boat. In that regard, Loon made a wise choice by installing a BWind 2.x at the heart of Oceanic. The BWind engine is simple and rock-stable; it’s also highly intuitive and very easy for a new skipper to learn. With that caveat, let me add that Oceanic uses a simple version of the BWind head’s-up display to give the crew feedback about real wind direction and intensity as well as boat speed. When the sails are too lax, they visibly luff and give an audible sail flap. 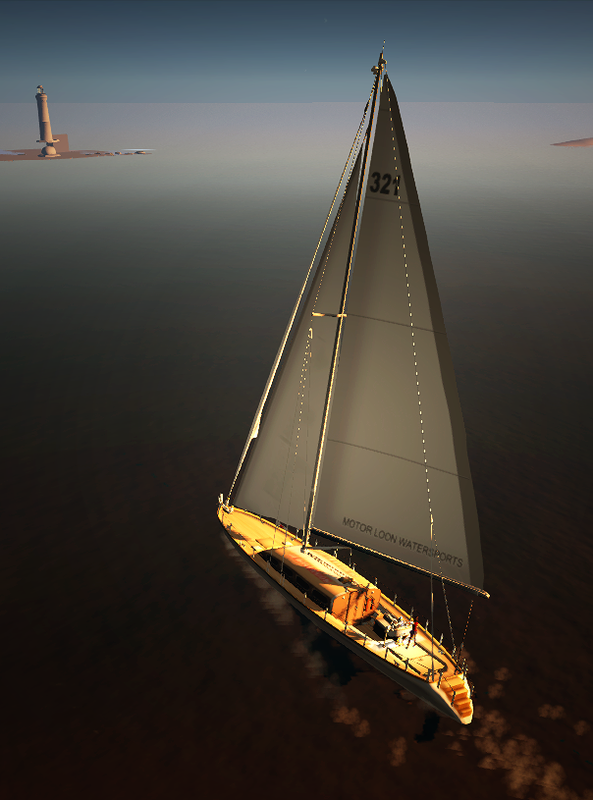 It’s pretty easy for a skipper to then tune the sails with the use of up and down arrow keys. As the sails adjust, there’s an audible winch-grinding noise and a final ‘pop’ when the sheet angle is optimal. The display turns green when you get that angle right, so there’s plenty of feedback to help a new sailor take confident control of the boat. 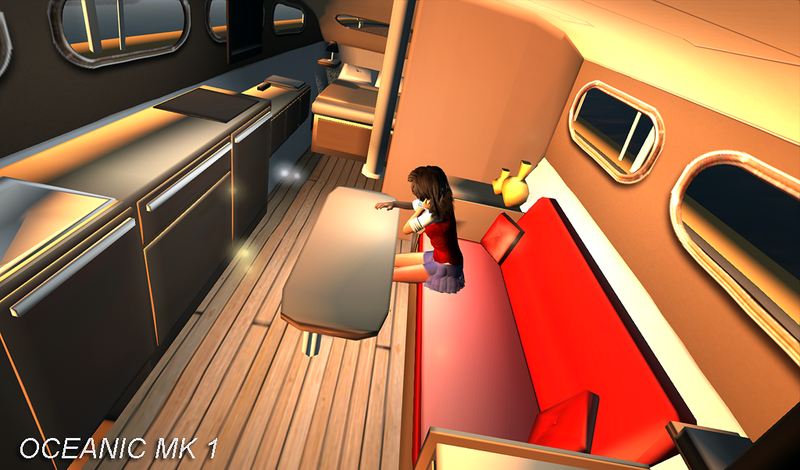 A single skipper is in charge of all Oceanic’s sailing functions, but the boat has lots of space and pose positions so friends can always come along for the ride. Motor Loon’s also included a rather unique sharing system. Once the owner is aboard the boat, the owner can hand over skipper responsibilities to another member of the crew. In fact, that person can keep sailing even when the owner falls overboard! 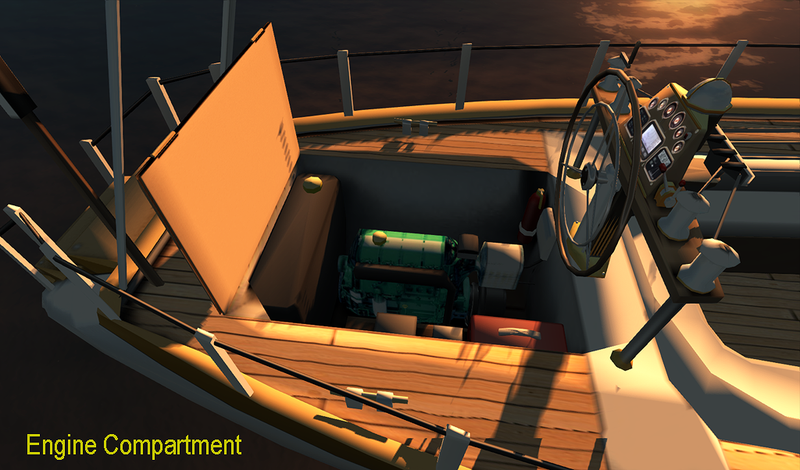 This is a pretty nice option that makes sailing Oceanic a more cooperative experience than other BWind boats. For upwind sailing, the Oceanic has a fractional rig with a mainsail and a single, standard jib. 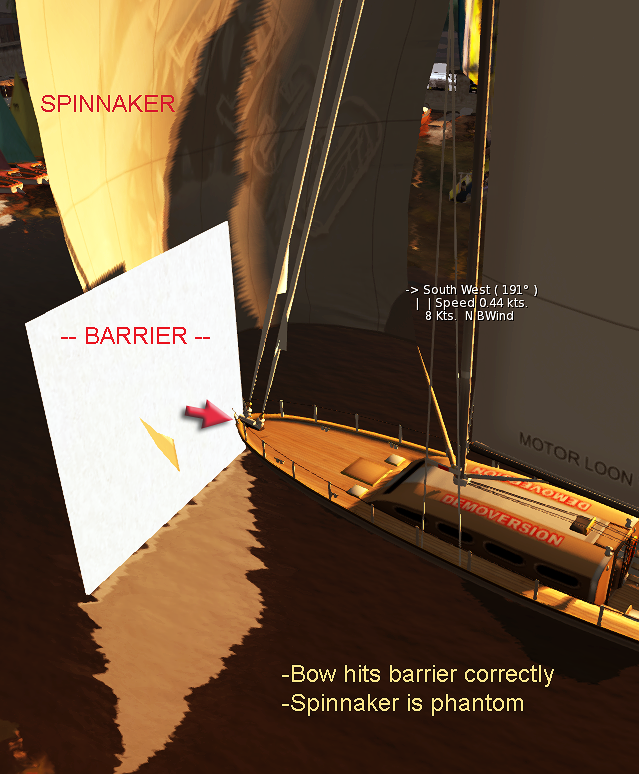 both sails are controlled together by keyboard or chat commands. There’s an option to change the communication channel to something more personal as well. If you look at the forestay, you’ll see there’s a second furler installed for a genoa jib. It’s not yet active in the Mk 1 version of Oceanic, but it shows that Motor Loon’s thinking ahead! 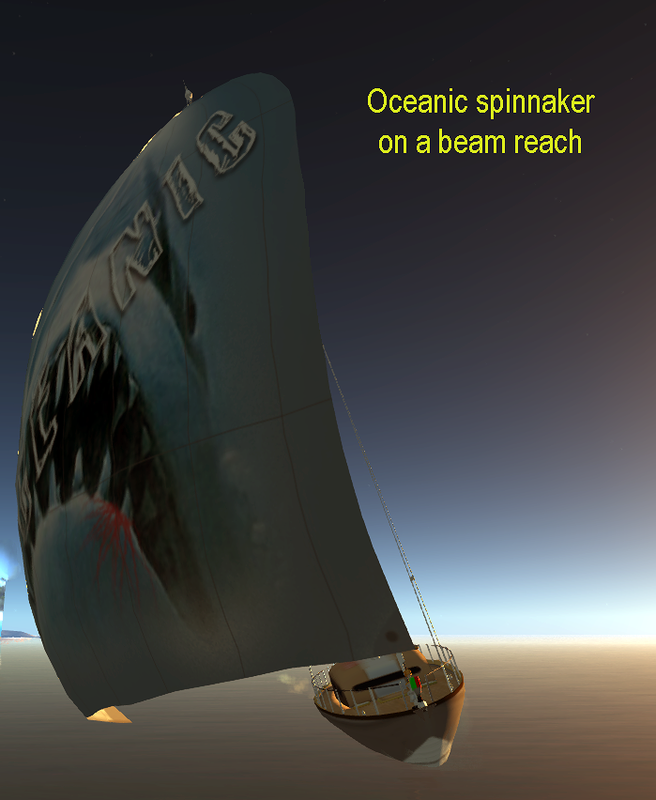 Speaking of more sails, the Oceanic also comes with a rather huge spinnaker that can be optionally deployed to add an extra boost when sailing downwind. It works on all points of sail from a beam reach to a dead run, and generates rather explosive acceleration (see the chart below). A spinnaker can be a pain to tend to when RL sailing, but it’s a real breeze using it on Oceanic! Once you’ve got that parachute out, it automatically adjusts to your wind heading without any bother. And when you turn upwind again, the spinnaker discreetly douses itself and disappears… until you call it back in service again. Here’s a simple chart that displays speed over ground (boat speed) as a function of real wind angle using the boat’s default wind speed of 15 kt. The boat ends up in irons when it tries to head closer than 30° windward. As it falls off the wind however, the boat comes to life and hits the maximum boat speed at a RWA of approximately 50°. 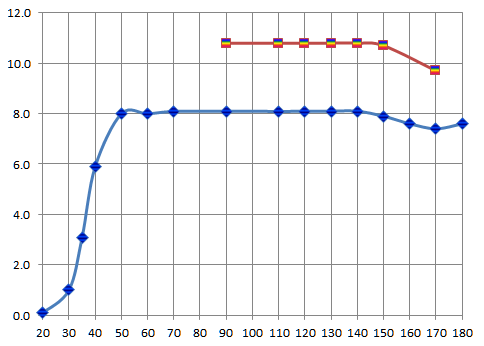 The performance curve then goes essentially flat for all angles out to around 150°. There’s then a slight loss of power as the boat lies on a dead run with the wind at its back. With just the jib and main up, a skipper can expect this boat to do roughly 53% of Real Wind Speed at nearly all points of sail. If that skipper then pops up the spinnaker, there’s a truly impressive downwind boost that should guarantee a boat speed around 72% of RWS. The Oceanic performance curve is very forgiving, and might be a little boring for true, salt-stained SL racers out there. However, that’s really not the target audience for this initial Loon release. Oceanic Mk 1 is designed as a high-end cruiser, and it fits that bill quite nicely. 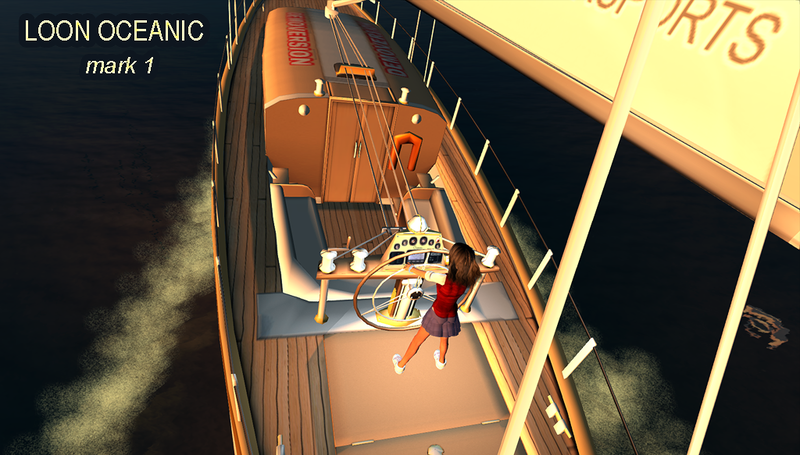 Oceanic will accommodate all your friends and keep you all safely afloat as you explore the winding waterways of Second Life. I think the Bottom Line is: Don’t listen to Jane. Go find out yourself! 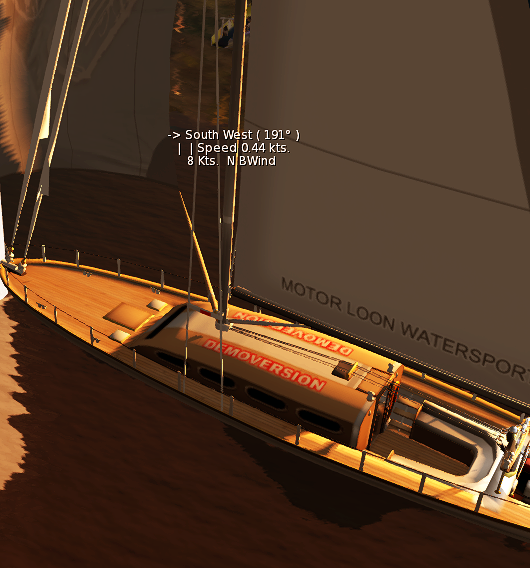 I’m writing this article because Motor Loon has a fully working, FREE DEMO of the boat available on SL Marketplace. That Demo doesn’t expire, and it has no limit to features. So, go give it a test drive, or maybe bring it along with you to the next Leeward Cruise in SL! This entry was posted in MLCC, Oceanic Mk 1, Sailboats. Bookmark the permalink. Aww, this is nice Jane. Very detailed and thorough… as usual. Thanx. 1. Motor Loon dropped me a note saying the Oceanic has adjustable sail alpha. He also said he’s willing to advise any owner that wants to modify their own Oceanic textures. Aquarius also gave me a link to Tasha Kostolany’s interview of Motor Loon. It’s full of great info and insight about the origin and design of Loon’s builds. So go read it! though. To be honest it seems this is a populair boat. And though it’s no racing boat really it might be still an idea to try if someone likes to race it.